The ECOCORP dry anaerobic digestion or composting process converts the organic fraction of municipal wastes such as yard waste, food waste and non-recyclable paper waste into biogas and a high quality compost. Agricultural waste, undigested sludge and animal manure may also be processed separately or along with municipal wastes. The process occurs at thermophilic conditions, i.e., 130 to 140° F, as opposed to the sanitation and wet anaerobic processes taking place at mesophilic conditions, i.e., 98° F for maximum biogas yield. The typical biogas yield is 5,000 scf (standard cubic feet) per ton of organic waste. The typical composition of the biogas is 60% methane and 40% carbon dioxide. About 20% of the biogas output may be used to generate electricity and steam for the treatment of the wastes in the facility. The residue is a high quality compost like material, stabilized and hygienically safe. Pathogens as well as plant seeds are killed completely because of the anaerobic and thermophilic conditions of the waste processing combined with the retention time in the digester. Resource and Energy Input and Output of the ECOCORP Dry Anaerobic Digestion Process per Ton of Processed Organic Waste. 1 Facility generates its own power from biogases. 2 Process heat captured from waste heat of electricity generation. 3 Use bulking agents (wood chips) to dewater digester effluents. 4 Methane fuel and carbon dioxide production assuming that 20% of biogas is used to generate electricity and low temperature steam to process the organic waste. The ECOCORP organic wastes to commercial by-products dry anaerobic digestion process is shown in a flowchart form. The incoming waste consisting of yard wastes, waste paper and food waste, after some manual sorting of plastics and corrugated cardboard, is deposited on a conveyor belt that feeds a screw shredder with ability to reduce and generate 40 mm (1.6 inches) or smaller in size waste. may take place first. A magnet may be used to remove metals from the 40 mm or smaller waste. The organic material that has thus been "sieved" is then retained in a storage or buffer vessel of about 360 ft3 (10 cubic meters) in volume for about an hour. Gray water is added as necessary to adjust the moisture content of the mixture to 35% to 40% solids content. The main function of this buffer tank is to equalize the moisture composition of the incoming organic materials. A second function of this storage tank is to act as a buffer in order to maintain a constant flow of substrate to the digester. Additional organic waste streams comprised of sludge and manure may be stores in the same or similar buffer tanks. The organic matter exiting from the moisture equalization/buffer tank is mixed with digested materials from the reactor vessel. The ratio of new materials mixed with digested materials may vary depending on the process from as little as one to one to as much as one to ten. This high recirculation ratio is employed to impart a high degree of stability in the process and reduce the retention time in the digester. A positive displacement pump (the design has been borrowed from the cement industry) is then used to move the mixture of new and digested organic materials into the reactor vessel. The digester is cylindrical in shape and has a volume of about 36,500 ft3 with typical dimensions of 7 m to 10 m (23 ft to 33 ft) in diameter and 21 m to 10 m (70 ft to 33 ft) in length (horizontal digester) or height (vertical digester). The reactor vessel is totally enclosed to the outside air. Likewise no gaseous emissions generated inside the reactor can escape to the outside. The temperature inside the reactor vessel, which ranges between 50 °C (122 °F) and 58 °C (136 °F), is maintained constant with the addition of low pressure and temperature steam premixed with the incoming fresh wastes. Approximately five percent of the digester's contents are removed each day. The effluent material is then dewatered to about 50% to 55% solids with the aid of a screw press. Biogas is extracted from the top of the reactor vessel and temporarily stored in fabric tanks under low pressure. If the biogas is going to be used to fuel motor vehicles, then the carbon dioxide has to be removed first in order to increase its heating value. The separation technique of carbon dioxide from methane constitutes a standard operational procedure in the production and marketing of natural gas and employs a selective membrane separation technique. The digester effluent is then mixed with wood (discarded lumber) ground in the facility and possibly any discarded dry wall material intended for the landfill and is mechanically dewatered. The dewatered material is conveyed onto a vibrating screen (10 mm) where any remaining large pieces are removed and land filled. The dewatered material is then cured for 10 days under aerobic conditions in a specific part of the facility. This material is marketed as ECOTEX™ and has the typical composition shown based on analyses performed by our team. 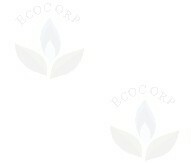 This ECOTEX™ material may be used as a high quality soil conditioner and a potting substrate. It can be sold in bulk or bagged at the plant and distributed to retailers. Due to the nature of the process, ECOTEX™ is pathogen free and has only traces of heavy metals well below the EPA allowed heavy metal content of compost material. Consequently ECOTEX™ meets the "EPA Exceptional Quality Compost" classification. A portion of the liquid filtrate from the screw press is reused in the process without any treatment. The remaining liquid filtrate is treated first by a centrifuge to bring the COD composition of the treated water to about 2,000 mg/l. The removed particles are incorporated into the compost material. The second step in the treatment of the extracted water is an aeration drum that reduces the COD to below 1,000 mg/l. The thus obtained water can be then either disposed in the sewer system or else undergo a third treatment through filtration and reverse osmosis, if it is going to be used as gray water for local urban irrigation purposes. The all enclosed facility indoor air is treated by a biofilter and discharged to the outdoors, thereby eliminating the release of offensive odors to the ambient environment. Facility Flow Chart Indicating the Elements of the ECOCORP Dry Anaerobic Digestion Process for Municipal Organic Wastes.